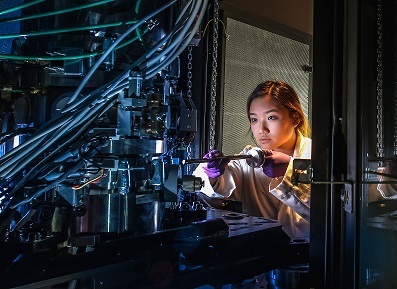 The Center for Electron Microscopy and Analysis (CEMAS) is the materials characterization hub for business and academia. With one of the largest concentrations of electron and ion beam analytical microscopy instruments in any North American institution, CEMAS brings together multidisciplinary expertise to drive synergy, amplify characterization capabilities, and challenge what is possible in analytical electron microscopy. This microscopy facility’s point of difference is their world-class multidisciplinary approach that enables academic and business partners to “see” more than ever before. CEMAS is the center that breaks through the current characterization limitations in medicine, environmental science, energy materials and beyond. The full-service facility – from extensive sample preparation laboratories to post-processing tools and support – allows researchers to carry out their entire microscopy and analysis program at CEMAS. Located in a highly customized facility on The Ohio State University’s West Campus, every instrument in the facility meets or exceeds manufacturer performance specifications. A support team of technical, research, administrative and academic staff based at CEMAS provides comprehensive support to all users through a variety of mechanisms from contract research to collaborative projects. World-class microscopy education in the theory of electron microscopy and all aspects of its use and operation is also available at CEMAS, both in-house and remotely, through our digital theater. Students have live access to CEMAS instruments in real time within a state-of-the-art classroom environment to meet every microscopy training need. Video wall technology provides multiple display screens and projectors, allowing simultaneous display of microscope controls, microscope outputs and lecture slides. Students and lecturers can interact with and operate electron and ion microscopes from within the digital theater in a live, seamless manner – as if one were sitting in front of the instrument. Control of the microscope can be transferred to members of the audience using wired and wireless connectivity. The microscopes can also be shared with students and researchers at geographically distant locations. Remote operation capabilities connect directly to the 100 Gb/s Ohio OARnet network, providing a unique opportunity for remote teaching and research to partners across the state of Ohio. CEMAS is pioneering the practical application of this technology for research and training of the next generation of electron microscopy specialists, providing an environment to facilitate world-class collaborative research, and maximizing productivity while minimizing economic and environmental impact. This remote electron microscopy collaboratory system has been installed at the University of Dayton, The Ohio State University’s Wooster campus and the Air Force Research Laboratory at Wright-Patterson Air Force Base (Dayton), with additional locations planned for the near future.